A good friend of mine and I met up a few days after Christmas to catch up and we decided to dine at Buffalo Wild Wings in Uptown Mall in BGC. He's one of my officemates I drag every time I want to eat Buffalo Wings. Buffalo Wild Wings is an American casual dining restaurant and sports bar franchise in the United States, Canada, India, Mexico, Oman, Panama, Philippines, Saudi Arabia, United Arab Emirates, and Vietnam which specializes in Buffalo wings and sauces. Of course, we ordered the chicken wings. 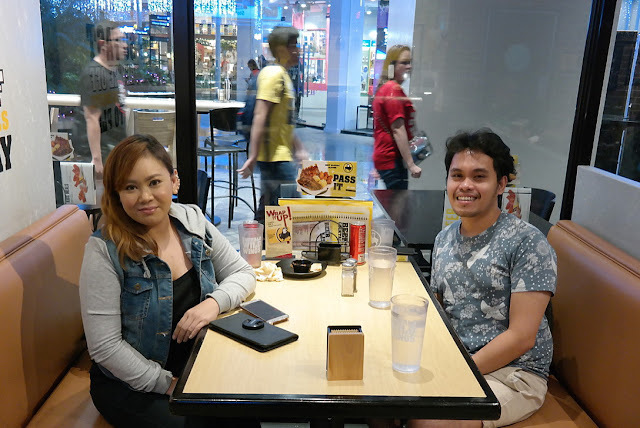 They offer their wings in different levels of spiciness and although my friend is Bicolano, we decided on getting the ones with neutral and mild spiciness since I have very low tolerance with the spicy food. We went for the Traditional Wings in Small which contains 10 pieces of wings and in two variants: Sweet Barbeque and Medium Buffalo. The Sweet Barbeque was satisfyingly sweet while the Medium Buffalo is a classic wing sauce which is comfortably hot. Buffalo Wild Wings is one of the restaurants operated by the Bistro Group. wings along with over a dozen sauces, as well as a complement of other items such as chicken tenders and legs. The chain's menu also features appetizers, burgers, tacos, salads, and desserts, along with beer, wine, and other beverages. They have a couple of branches around Metro Manila and this one in Uptown Mall is quite huge and follows a sports bar interior with large tv screens showing sports games, with seating areas perfect for groups like long and booth tables. I find the wings a little bit small and a little bit dry if I have to be very honest. The wings came with carrot and celery sticks with a blue cheese dip. We both liked them especially after pairing them with white steamy rice. Yet I must say we weren't wowed by them. We also tried their new dish which is macaroni and cheese topped with chicken breast cubes and came with slices of toasted bread. I like this a lot since the pasta was cooked perfectly well and was very very cheesy. It was a satisfying late lunch to say the least and I think I would still consider going back one of these days to try their other chicken wings flavors.